Graham, Benjamin; James H, Lorie; Frank E. Block; John Burr Williams; Arthur B. Laffer; Walter P. Stern. Charlottesville, VA: The Financial Analysts Research Foundation, 1974. 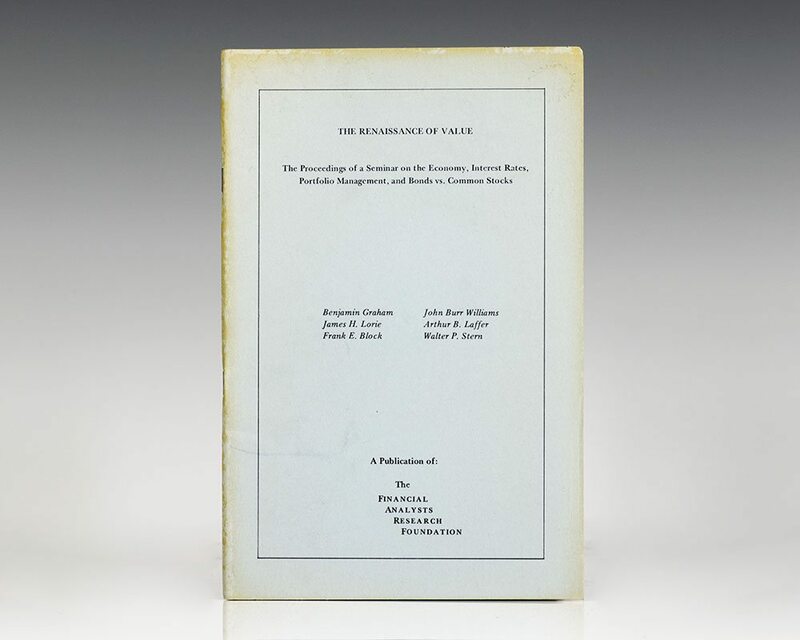 First edition of this work regarding interest rates, portfolio management and bonds vs. common stocks. Octavo, original wrappers as issued. In near fine condition. Rare. Benjamin Graham was an investor, economist, and professor. He is widely known as the "father of value investing," and wrote two of the founding texts in neoclassical investing: Security Analysis (1934) with David Dodd, and The Intelligent Investor (1949). His investment philosophy stressed investor psychology, minimal debt, buy-and-hold investing, fundamental analysis, concentrated diversification, buying within the margin of safety, activist investing, and contrarian mindsets. After graduating from Columbia University at age 20, he started his career on Wall Street, eventually founding the Graham-Newman Partnership. After hiring his former student and future manager of Berkshire Hathaway, Warren Buffett, he took up teaching positions at his alma mater, and later at Anderson School of Management, and the University of California, Los Angeles. His work in managerial economics and investing has led to a modern wave of value investing within mutual funds, hedge funds, diversified holding companies, and other investment vehicles. Throughout his career, Graham had many notable disciples who went on to receive substantial success in the world of investment, including Buffett, who described him as the second most influential person in his life after his own father.